People who sign up and show up are motivated to solve a problem or fill a need, and they already trust you to some degree. You want to make sure that the webinar you produce meets their expectations – while maximizing your opportunities for conversion. 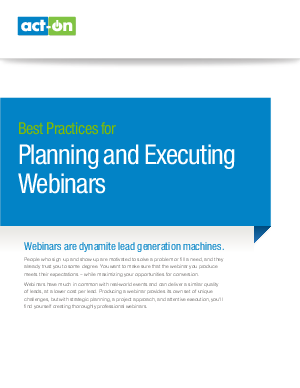 Webinars have much in common with real-world events and can deliver a similar quality of leads, at a lower cost per lead. Producing a webinar provides its own set of unique challenges, but with strategic planning, a project approach, and attentive execution, you’ll find yourself creating thoroughly professional webinars.